Well, the end of our 50th Anniversary year is rapidly approaching, but what a fabulous year it has been! Starting in November, we performed Richard Roddis’s own composition Lauda Creatoris. What an exciting work this proved to be! This was followed by our two Annual Christmas events in December at Patchings Art Centre and West Bridgford Methodist Church. In January we held an extremely well-supported Come and Sing/Play workshop when we studied Bach’s magnificent B Minor Mass. The performance of this monumental work in Southwell Minster in March was the highlight of our year. Under Richard’s excellent direction and supported by the Baroque Ensemble, led by Nicolette Moonen, the choir gave one of its most memorable performances. We all felt that it had been a privilege to be a part of such an event and judging from the many comments and tweets from the audience, they too felt it had been a very special occasion. So now we reach our Summer events which bring our anniversary year to a close. 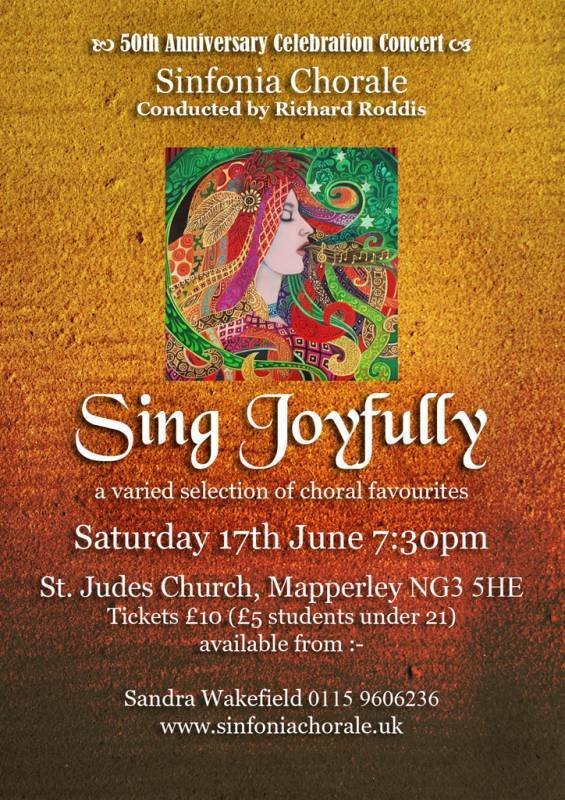 Sing Joyfully is the title of our concert on June 17th, at St Jude’s Church Woodborough Road, Mapperley, NG3 5HE at 7.30pm. This will be a re-union event and we shall welcome back some of our former members. 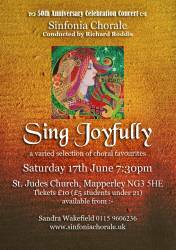 The programme will include some of the choir’s favourite pieces, both sacred and secular. There will be English madrigals, including the Silver Swan and Hark, all ye lovely Saints above, Tudor Anthems Sing Joyfully and If ye love Me, European Sacred music Locus Iste and Crucifixus. From the twentieth century repertoire we have part of the G Minor Mass by Vaughan Williams, The Hymn to St. Cecelia by Benjamin Britten as well as pieces by Eric Whitacre, and arrangements by Richard Roddis – an altogether eclectic mix! Tickets are £10 (£5 for students) and are available from Sandra Wakefield, Tel: 0115 960 6236, the Sinfonia Chorale website or at the door. 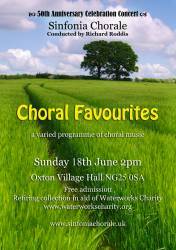 On the following day, Sunday June 18th we are performing for Waterworks – a charity providing clean water and hygienic sanitation systems in Malawi. This concert will be an hour long and will take place in Oxton Village Hall at 2pm. Admission is free but there will be a retiring collection. As this season ends we are, of course planning the next. Our first concert of the 2017/18 season is at St John’s Church, Carrington on Saturday October 14th at 7.30pm. This will be a performance of Mozart’s Requiem in the Czerny piano arrangement for Piano Duet. Tickets are £12 (£5 for full time students) and will be available from the usual outlets. As always, we are extremely grateful for your continued support and we hope you have enjoyed celebrating our 50th Anniversary with us. We look forward to seeing you at our future concerts.